Fundamentals of Osteoporosis offers a concise yet comprehensive source of all the latest basic research related to osteoporosis in one reference work. Experts from all areas of osteoporosis research expose readers to genomic and proteomic analysis, and histopathology and imaging, as well cellular and molecular mechanisms relevant to assay development and drug discovery. Academic, medical, and pharmaceutical researchers in bone biology, endocrinology, and rheumatology; Medical researchers in pediatrics, internal medicine, orthopedics, primary care, geriatrics, obstetrics and gynecology, oncology, and nephrology. Dr. Marcus is Professor-Emeritus, Stanford University, where he served on the full-time medical faculty for almost 25 years, before joining the Emeritus faculty in 2001. At Stanford, he was located at the Veterans Affairs Medical Center, Palo Alto California, where he served as Director of the Aging Study Unit of the Geriatrics Research, Education, & Clinical Center from 1982-2001. Dr. Marcus enjoyed a long career as a clinical investigator in the fields of bone and mineral metabolism and osteoporosis medicine. His own research interests included diagnosis and therapy of primary hyperpara-thyroidism, interactions of the parathyroid-vitamin D axis with estrogen, age-related changes in the growth hormone-IGF axis, effects of growth hormone replacement for older men and women, metabolic and musculoskeletal effects of resistance exercise in older men and women, adolescent bone acquisition, and osteoporosis therapeutics. Dr. Marcus’ laboratory was a study site for many of the pivotal clinical trials in the osteoporosis field. These include the NIH Post-menopausal Estrogen/Progestin Interventions Trial (PEPI), Merck’s Fracture Intervention Trial (FIT), Lilly’s Multiple Outcomes of Raloxifene Intervention (MORE), and Lilly’s registration trial of recombinant PTH(1-34) in the treatment of postmenopausal women with osteoporosis. In 2001. Dr. Marcus joined the US Affiliate of Eli Lilly & Company to support Lilly’s program in Osteoporosis and Skeletal Medicine. From 2003 until his retirement from Lilly in 2008, Dr. Marcus was the lead physician for the Forteo team at Lilly. He has published more than 150 research papers, editorials, and reviews. Dr. Marcus served as President of the American Society for Bone & Mineral Research in 2000-2001. David Feldman, MD, is Emeritus Professor of Medicine (Active) at Stanford University School of Medicine where he has been on the faculty since 1974. He has been a full professor since 1984 and was chief of the Endocrinology Division for 10 years. His laboratory studies the role of steroid hormone receptors, particularly the vitamin D receptor, and its mechanism of action. His current major research focus is hormone-dependent cancer including breast cancer and prostate cancer and the pathways by which vitamin D inhibits cancer growth. Professor Feldman is actively involved in both basic science approaches to the anti-cancer actions of vitamin D as well as to clinical trials studying the use of vitamin D in breast and prostate cancer. Professor Feldman was recently honored with an award for a Career of Outstanding Contributions to Vitamin D Research. He has authored over 290 medical research articles, reviews, editorials, and book chapters. In addition to being a co-editor of all four editions of OSTEOPOROSIS, he is the editor-in-chief of Vitamin D, just published in its third edition. Wayne State University, Detroit, MI, U.S.A.
Dr. Rosen is Professor and Senior Scientists at The Jackson Laboratory, Bar Harbor, Maine, where his group studies the role of insulin-like growth factors on bone and the genetics of osteoporosis in inbred strains of mice. In 2007 he joined the Maine Medical Center Research Institute in Scarborough, Maine. He is also the former Director of the Maine Center for Osteoporosis Research and Education, St. Joseph Hospital, Bangor. Dr. Rosen is a Past President of the American Society of Bone and Mineral Research (ASBMR). He served five years as the First Editor in Chief of the Journal of Clinical Densitometry, the official journal for the International Society of Clinical Densitometry, and currently serves as Associate Editor of the Journal of Bone and Mineral Research. His publications exceed 270 manuscripts published in a wide spectrum of clinical and basic science journals. "This volume covers a comprehensive series of topics from structural parameters of bone to development of the skeleton, differentiation of the bone cell lineages, bone matrix and its mineralization, and the multiple kinds and levels of regulation that influence all of these. Well-covered are what I will call intrinsic regulators, e.g. the specific cells and their genes, transcription factors, matrix components, receptors, and extrinsic - even if locally produced - regulators, e.g. cytokines, hormones, growth factors, mechanical forces and the often complex regulatory networks that result and control development, growth and aging of bone and its turnover in health and disease. There is something for expert and novice alike in this volume, and the chapters overall deal well with and make quite accessible the explosion of information that has occurred in all areas of bone biology. 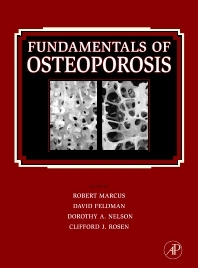 Beyond a couple of chapters that deal explicitly with important fundamental concepts and issues related to defining what osteoporosis or osteoporotic bone is, many of the others address how advances in basic bone biology have contributed to the understanding of osteoporosis and other bone diseases and have pointed towards new therapeutics. The chapters appropriately and clearly identify gaps and directions for new research and almost all are nicely sprinkled with helpful tables, graphs, photomicrographs or other images, and summary schematics. This book provides authoritative and comprehensive coverage of most of the main current topics in bone biology."